Thanks to some fine reporting by the incomparable Don Sherman, as well as some very reliable source material *cough* regarding the car's visuals, Car and Driver has assembled the fullest picture yet of next year's 2014 Corvette. This unauthorized preview can be found in the January issue, and you'll get the official C7 story from C/D.com and Jalopnik after GM unveils the car at the Detroit Auto Show next month. In the meantime, though, here are some highlights of what Car and Driver knows so far. Remember how, for the current-generation Z06 and ZR1, GM did an unprecedented thing and replaced the hydroformed-steel main spaceframe members with aluminum ones? Well, now even the base car's rails are alloy. GM has aggressive weight targets for this car, so the panels, bulkhead, and floor-of the base car-will be fashioned from composites. No more Goodyears as base fitment. Pilot Sports, y'all. Porsche did the 7-speed-manual thing first, and ingeniously so, with one box for both self-shift and PDK applications. Here, the 7-speed stands alone, but needs only four gates rather than the Porsche's five to get the job done (don't forget reverse). 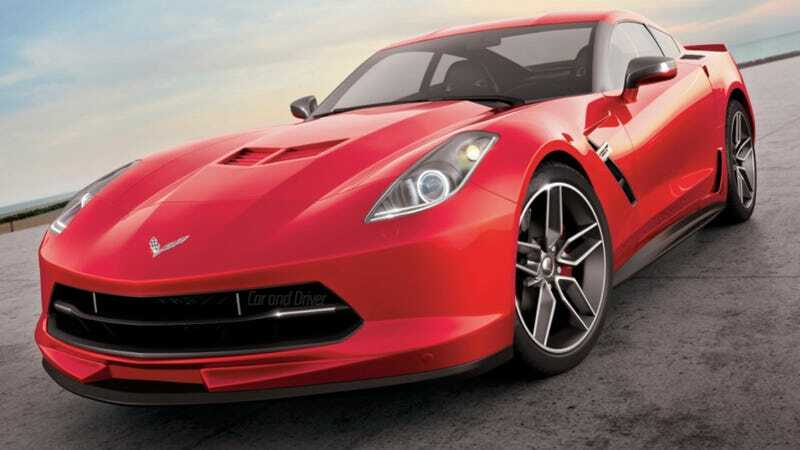 Although rumors had it bearing a twin-turbo V-6, the Stingray, the Corvette that jams econo, will be powered by a 400-hp 5.5-liter V-8, and should give 30-plus mpg on the highway. This story comes courtesy of Car and Driver. Full details in the January issue, on newsstands now. Email us with the subject line "Syndication" if you would like to see your own story syndicated here on Jalopnik.